Colebrook 7-pc. Dining Set The Colebrook 7-piece dining set embodies casual design at its finest. The plank tabletop and rustic oak finish have a country chic look that's enhanced by the bowed, spindle-back chair design. Plus, the two extension leaves make it easy to accommodate guests or large family dinners. The Colebrook 7-piece dining set embodies casual design at its finest. The plank tabletop and rustic oak finish have a country chic look that's enhanced by the bowed, spindle-back chair design. Plus, the two extension leaves make it easy to accommodate guests or large family dinners. L: 72" x W: 44" x H: 30.5"
Maximum Weight Capacity: 262 lbs. L: 24" x W: 21" x H: 41.5"
L: 26" x W: 23" x H: 41.5"
Maximum Weight Capacity: 477.5 lbs. 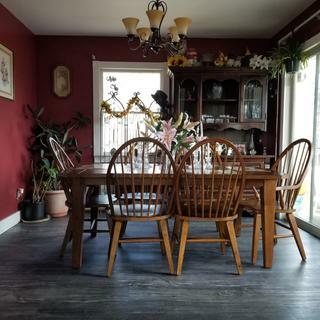 I fell in love with this dining room set immediately! It is my perfect style and looks great in my home - I am having a great time decorating to show it off. It is excellent quality - couldn't have asked for a better set. The set is beautifully crafted. The chairs will withstand the abuse that a large family with children are known to inflict upon furniture. The table is beautifully crafted and the leaves are easy to install. Wonderful overall experience. I am so happy with my purchase and the whole process was so simple. 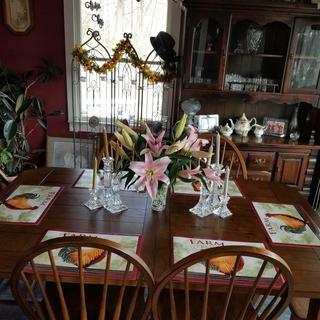 I absolutely love the dining room table and chairs I bought. The quality is excellent and the customer service and delivery were exceptional! Dining set worked out exactly as we had imagined for the room. The construction is solid and sturdy, likely to last without serious wear for years to come. The additional wings allow for meaningful flexibility as to table size, a helpful feature when hosting larger gatherings. This table has two leaves. Great for big family gatherings. I love my new set. 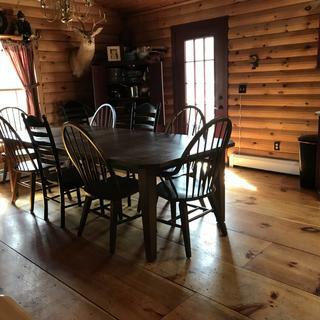 Does this table come with a bench? BEST ANSWER: It does. SKU 695238204 displays an option that includes a bench.